Lab safety equipment is primarily installed for two primary purposes: to protect laboratory personnel from hazardous substances, and to isolate sensitive samples from reactant atmospheres. Cleanroom environments are widely employed to provide safe working conditions for handling reactive or harmful substances, but such extensive safety methods are often unsuitable for laboratories of smaller scales and lower analytical throughput. Regardless of the size or scale of operation, safety is a fundamental concern for all biochemical facilities worldwide. Lab safety equipment is suitably scaled to provide unique security solutions for sample handling with improved economy. This blog post will explore Glas-Col’s lab safety equipment for sample handling in more detail. Air sensitive samples must be handled in inert atmospheres to eliminate measurement inaccuracy due to oxidization or reaction with ambient gas species. This is difficult in absence of a cleanroom facility. The GLOVEBAG from Glas-Col was designed as a solution to smaller scale sample handling in inert atmospheric conditions. This convenient tool is fabricated from thin polyethylene, providing a flexible container that can be inflated and purged rapidly as required. Any number of gases can be used to inflate the lab safety equipment, with an integrated equipment sleeve providing direct access to its interior. Sensitive samples can be handled directly with no risk of cross-contamination and fast purging capacities. Our GLOVEBAG is a unique piece of lab safety equipment that is both economical and sturdy. If your samples require biochemical sterility, the GLOVEBAG is inexpensive enough to be treated disposable. It has been tested for multiple uses and is suitable for repeated tests with compressed nitrogen (N) at 99.99% purity. The Glas-Col GLOVEBAG can also be used with filtered air to provide a particulate-free environment of ambient atmospheric compositions. Hazardous materials typically require more robust lab safety equipment to provide secure sample handling. Any experimentation where a sample is heated is unsuitable for the GLOVEBAG as the plastic exhibits relatively low thermal integrity. 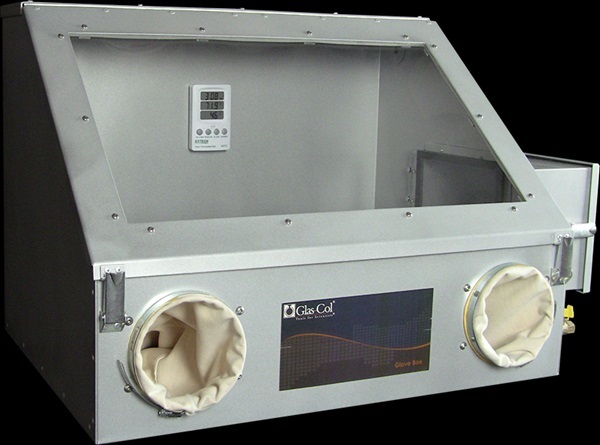 A Glove Box is, therefore, the preferred method for handling potentially harmful substances in inert atmospheres at varying pressures and temperatures. Typically comprising an aluminum shell and a slanted acrylic viewing port to provide observation of the sample, a Glove Box offers direct sample handling with a protective containment barrier between the analyst and the sample. These airtight compartments are accessed via integrated plastic sleeves. Our range of lab safety equipment comprises Glove Boxes of three distinct volumetric capacities, each of which is equipped with an internal hygrometer for direct monitoring of the reaction of process conditions within the sample chamber. Humidity and water vapor can be rapidly measured to maintain optimal conditions and inform requisite atmospheric purges. Glas-Col supplies an extensive range of instrumentation for laboratory applications, including lab safety equipment for both sensitive and hazardous sample types. Our GLOVEBAG products are available in a range of dimensions and two basic designs, and our Glove Boxes provide a reliable environment for handling samples with potentially dangerous properties. Read about our Lab Safety Equipment for Vapor and Air Control if you would like more information about the lab safety equipment that we provide. Or, contact us if you need any more information about our product range.